Go for a bike ride! We have an awesome bike path! If you didn’t bring your bike, rent one from the nice folks at Hiway 58 Bikes. Their shop is located across the street from the Emerald Plantation Shopping Center on Emerald Drive. Take a stroll on the Bogue Inlet Fishing Pier. It’s free, and the best time to go is at sunset! Get to the Point! As in the point at the end of Coast Guard Road. The sunsets there are spectacular! It isn’t free, but it’s well worth it. Rent a kayak and cruise Bogue Sound. Better yet, take a tour of Bear Island. You’ll need to leave the island and head over towards Swansboro if you want to paddle to Bear Island. Barrier Island Kayak Rentals is located in Cedar Point on the left as you’re driving to Swansboro. 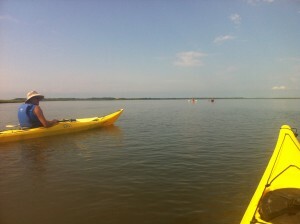 Plan on a 2 hour paddle each way if you decide to cruise to Bear Island. We recommend you schedule a guided tour. We’ve rented from the nice folks at Hot Wax in Emerald Isle and these folks in Swansboro when we paddled to Bear Island. Want to be adventurous? Rent a stand up paddle board. It’s a blast! Eat seafood! You’re at the beach for crying out loud. It won’t be free but there are several reasonable eateries. Check our list of great Crystal Coast restaurants. Don’t forget to check Yelp for reviews. If you’ve been to Emerald Isle be sure to leave a comment and tell us about your favorite thing to do here on the Crystal Coast!